This is beautiful! 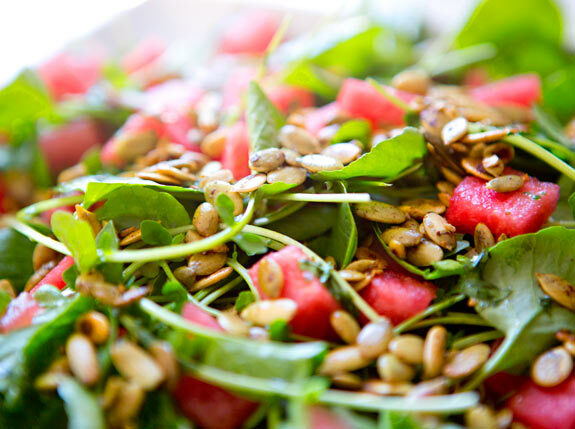 I've made a similar salad with arugula, watermelon, and feta (not dairy free)–and I can't wait to try this version. Yum! 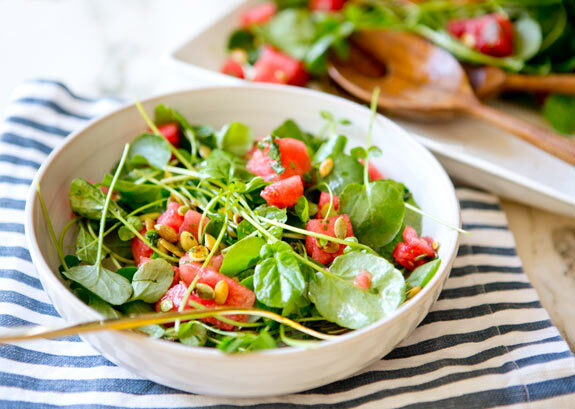 I love the mixture of fruit/ salad in the summertime. 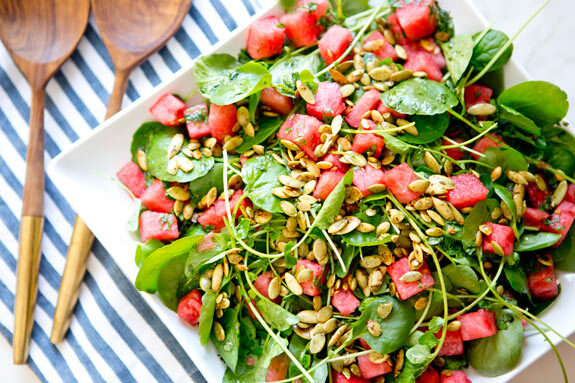 There is a Watermelon/ feta /mint salad I make biweekly in the summer – its so refreshing! This one looks even better! And a lime cilantro vinaigrette?! Two of my favorite things in life!! I'm going to have to try this one out! 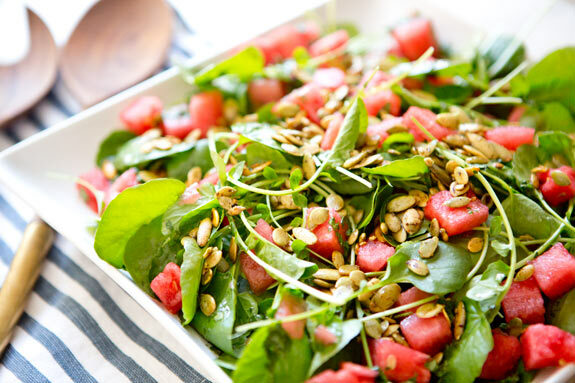 This certainly does look like the perfect salad! Anything topped with pepitas has me sold! Oh yum! We did a southern style bbq over the weekend and the salad we made was spinach, candied pecans, strawberries and goat cheese. We had a ton of leftover bbq, but that salad plate was licked clean! Yummmm, I would have never thought of all of these flavor pairings. Thanks for the recipe! My friends and I are on a low carb diet which leaves a lot of room for salads. 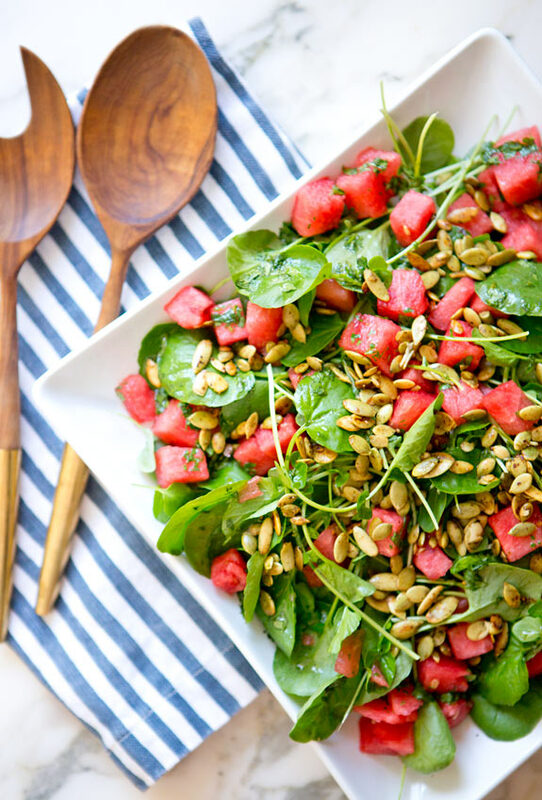 I can't believe I never thought of putting watermelon on a salad! It looks delicious; I will definitely have to try it. Thanks! Agreed! I am forever looking for a salad to serve with tacos/fajitas/etc. that isn't rice or bean based. Thank you for this. It looks amazing! It looks so refreshing for a hot weather day! I'm dying!!! This looks soooo good!!!! Definitely happening for my next BBQ!!!! Just had this for lunch today–so, so good! The pepitas are just perfect in it. Could I use sunflower oil instead?